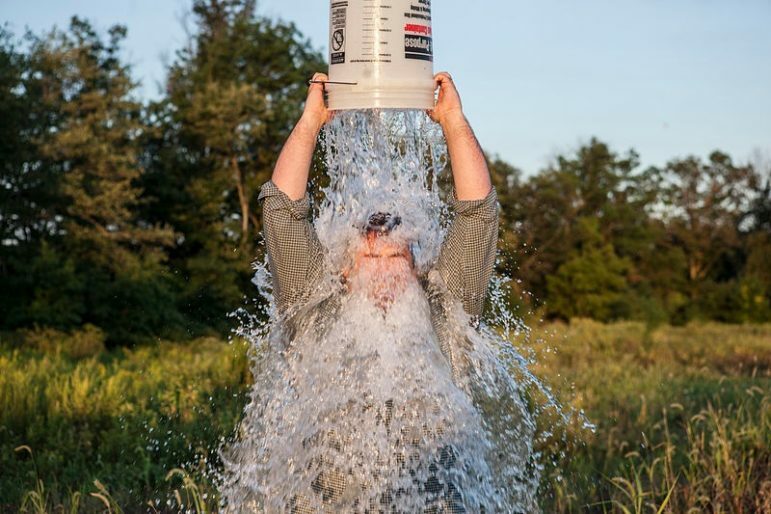 This August marks the two-year anniversary of the ubiquitous Ice Bucket Challenge, a viral campaign affiliated with the ALS (Amyotrophic Lateral Sclerosis) Association (ALSA). As NPQ readers—really anyone with access to a digital screen—will recall, the challenge charged its participants to dump a bucket of frigid ice water on their head and call out their friends to do the same, all while raising awareness and, ironically, dollars for ALS research. Ironic because the original challenge’s rules actually spelled out that the ice bucket was in fact an alternative to making a monetary donation to the organization. Because what’s colder than soaking oneself in ice water? Apparently, charitable giving. What’s even more ironic is despite the massive volume of people who ostensibly opted for dousing rather than giving, the Ice Bucket Challenge resulted in an astoundingly successful fundraising year for the ALS Association. In 2014, the ALS Association saw 308,000 new donors and secured $115 million in gifts. Impressive for any organization’s standard calendar year, beyond extraordinary when it’s achieved in a six-week period, as was the case for the ALSA, thanks to the Ice Bucket Challenge. ALSA has made commendable effort to keep the awareness brought on by the Ice Bucket Challenge front and center, launching the #ChallengeALS campaign aimed at educating individuals on what more they can do to help further ALS research after they’ve dried off. It’s worth noting that in 2015, one year after the ice-cold phenomenon took over all social media feeds, ALSA did raise $1 million during the month of August, significantly less than the August before, but nonetheless a praiseworthy number by normal standards. So while those who participated in the Ice Bucket Challenge might remember that one crazy summer when they played a part in one of the most popular fundraising campaigns to ever hit the sector, their memories aren’t necessarily prompting renewed financial support, at least not at the same level as before. Of the 2.6 million donors that contributed the record-breaking total in 2014, 23 percent gave ALSA permission to continue communications. The considerable dip from 2014 to 2015 in philanthropic revenue generated, coupled with the aforementioned example, perhaps represents the transactional nature of the campaign altogether. Like anything online that goes viral, there is a limited lifespan and eventually people’s attention will move onto the next trending topic. When a viral marketing approach is applied to a fundraising initiative and gains fast speed like the Ice Bucket Challenge did, it is undoubtedly difficult for an organization to maximize the opportunity to develop meaningful and long-lasting relationships with the gigantic influx of campaign donors. But could the Ice Bucket Challenge, a sort of one-hit wonder, be the product of a much larger challenge the nonprofit sector is facing? Especially since the introduction of social media channels, well-intentioned individuals are becoming increasingly more likely to “support a cause” via liking, sharing, and posting online about their commitment to an organization instead of actually supporting the cause head-on via things like advocating, giving and volunteering. The ice bucket challenge is a symbol for much that’s wrong with contemporary charity: a celebration of good intentions without regard for good outcomes. It is iconic for what I call donor-focused philanthropy—making charitable giving about the giver, rather than about those who need help. Because the idea for the Ice Bucket Challenge did not actually originate within the ALSA, the rapid acceleration of the campaign left the organization with no choice but to implement reactionary strategies in an effort to embrace all the good it brought to their cause. Although in the past year the campaign has not reached previous levels, Munk says the organization has prepared to be more prepared for those supporters wanting to make it an annual tradition. “We [had] the luxury of being able to plan for the campaign and not be 100 percent reactive,” Munk said. The co-directors of GrantAdvisor, a Yelp-like site that rates the nation’s charitable foundations, describe how fears of retribution in the field inspired them to launch the platform, and why honest dialogue between nonprofits and foundations can help make philanthropy better.